I wrote this while dating Ben who is now my husband. 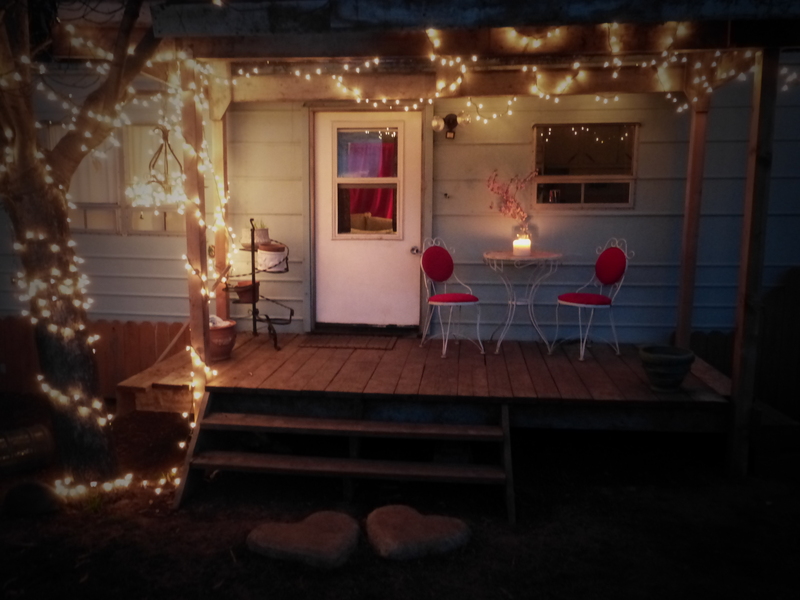 This is our current house, but we have done so much home-building since I wrote this story. My house is not beautiful. In fact, it isn’t even pretty. It’s small, but carries so much inside of it. It seems as though many houses on this block are that way. Very small, but stuffed full of many things. A lot of windows are barred, the doors are locked, the lawns are needing care. My house is near the end of the block, people come and go. I am open enough to have people come by, but not open enough to let them come inside and stay. Besides, they usually felt like leaving after seeing the outside of my house. It wasn’t sad to me that people left often, because I wasn’t lonely. I neither had a best friend ,nor an enemy. I was just living. This was my house, broken in some rooms, packed full of memories in others. Dreams and hopes hanging on the walls. Love stored in every room, some full, some empty. I had my closet of fear in the back, my hallway of failures, of course. But I was happy. I didn’t mind taking care of my house alone, but I don’t think I realized how much I was missing. When you are alone, you don’t always notice the cobwebs in the tiniest corner, the dirt hiding underneath the table, the windows that need some washing. You get used to your house, you don’t see those things. I guess that’s how I became. Used to my house. I wasn’t expecting any visitors today. I never really did ,and those that came always left pretty quickly. I never blamed them for leaving. It just wasn’t a beautiful house. I hear the knock at my door mid-morning. I stuff my fears in the closest and quickly put away anything scattered that I don’t want to have someone see. I open the door, maybe a little too happily, and see a man standing there. I know nothing of him, but he saw my house and came knocking anyway. I have no idea why. I step outside and close the door behind me. I really don’t want him to see my house. “Hey, how are you?” I give my attempt at casual conversation. He answers my question kindly. He gives me his name. It is a good name. Then, he asks for mine. I tell him, and then invite him to sit on my overgrown lawn. How embarrassing. But, at least he’s not inside my house. I am surprised at how easy it is to talk to him, how comfortable it is to be with him. Even on my overgrown lawn in front of my un-beautiful house. We talk until the sun goes down, and then he leaves. But, unlike the others, he asks if he can visit again. I am speechless, but manage to nod my head yes. I watch him walk away and then turn to go into my house. The next morning was gorgeous, or maybe I was just in happy spirits because I had a visitor yesterday. I ready myself for the day and wait rather impatiently for him to knock on my door again. One hour passes. Then, two hours. Just as the third hour ticks by, I convince myself that he realized how ugly my house was and he wasn’t returning. That’s when I hear the knock. I wish that we could just sit on my lawn forever. I was comfortable letting him sit on my lawn. But, walk into my house? That was different. Let him see the pictures hanging on my wall? I don’t think so. Let him walk down my hallway? Definitely not. Have him visit the rooms that I wasn’t really proud of? Even the broken ones? I hadn’t cobwebbed in awhile. There’s probably dirt that he will see everywhere. He’s waiting patiently for an answer. And, did he say he thought my house was pretty? I don’t even know how he came up with that. I pull at my shirt, rip at the grass, glance at the sky. I know I look perplexed even though I’m trying very hard not to be. I look to his eyes. There’s no judgment there. Somehow, I know that he won’t laugh at what he finds. I also know that he won’t run away. He helps me to my feet and leads me to my own house, because I am nervous, and I have not pulled myself together. Before we step inside he turns to me and says, “I want to know your heart.” I nod my head silently. Scared, yet trusting. I open the door and let him walk inside. “Welcome to my house,” I say hesitantly. I watch him smile. “It’s beautiful.” I hear him say this and wonder if he has gone crazy. If he only knew about my fears in the closet, my broken rooms, the pictures on the walls that I’ve long since thrown away. I take him to some of my rooms. Not all, but some. Every room that he walks into, he stays in. I am the first to leave each room, not him. I bring him to one of my most broken rooms. He stands quietly, taking in the damage, but not judging me for it. He reaches for my hand and says, “You know, back at my house, I think I have some pieces that will help this room. I think we can build it back. If you’ll let me, I will help you.” He wants to help me? He wants to care for this broken room? For me? I look at him, shock written all over me. But, of course I want him to help me. I know that 2 people care for a house better than one. I manage to put words together. “Yes, I…yes, I would like that.” His smile is bigger than any that I have ever seen, and he’s standing in the middle of my broken room. He wants to help me. “It’s a beautiful house, you know.” I just look to the ground, because there is so much of this house that is not beautiful. “Let me show you my house, I don’t live that far away. There are parts of my house that are broken too, but I noticed some of your pieces that would help repair my house.” I listen to him, willing to give him any piece of my house to help out his. He’s already done so much for me. I can tell his fear has subsided. He knows that I care. That I won’t judge. I lead him outside of my house and we walk toward his. And it’s in this moment that I know I will be able to show him my closet of fear. I know that I can show him the cobwebs hiding in the corner, the windows that need cleaning. I know that he will care for what is mine. And, with a certainty, I know that I will care for what is his. Together we are saying, “This wall, can I take it down? Can I help you clean this window? Will you let me fix this broken room? 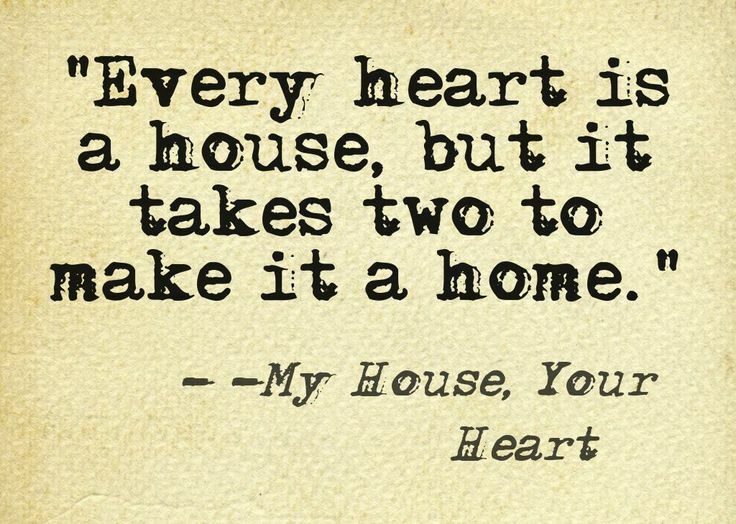 Maybe some of my pieces will fit the house of your heart and together we can make it a home.” Because every heart is a house, but it takes two to make it a home. Oh You’re in the Honeymoon Stage! So pretty. Enjoyed reading this so much!